Rich, moist and flourless – this Austrian chocolate cake is the epitome of decadence. 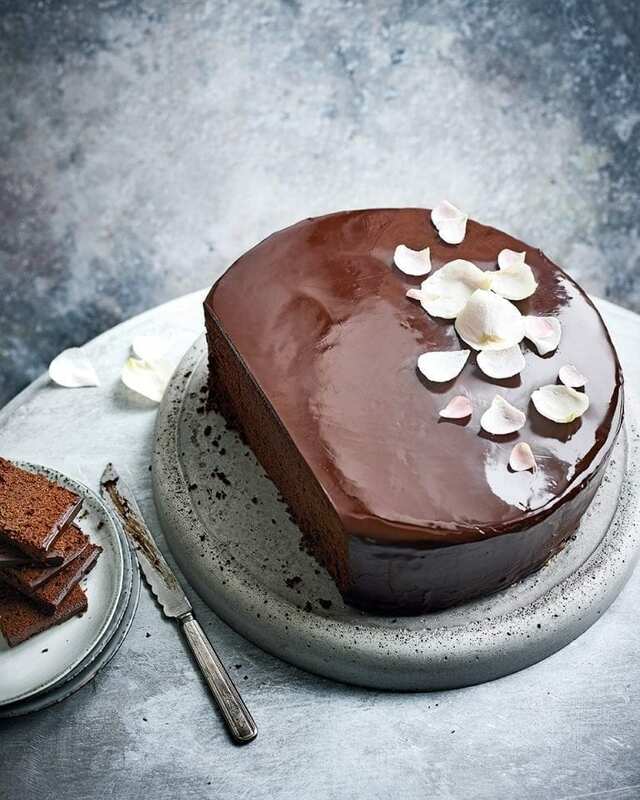 Follow Lorna Wing’s recipe for a three-tier sachertorte, or just one cake. For a professional finish ice the cake again with one or two more coats of icing more: put the leftover icing back over the pan of barely simmering water to melt again, then remove and allow to thicken, as before, and give the cake another coat. Chill until the icing has set, then repeat the process and chill for about 1 hour. Any spare icing on the trays can be saved and used at the last minute to disguise any marks – just melt it, then pass through a sieve into a small lidded container to remove any crumbs and refrigerate. If your thinking about making a triple decker sachertorte cake, do not attempt to make all three cakes in one go. Make them one at a time and cool completely before icing. Make ahead: To freeze, wrap the un-iced cake in a double layer of cling film, then in a double layer of foil and freeze for up to 2 months. Defrost overnight at room temperature before icing. Or make up to 5 days ahead, wrap as above and keep in a cool place. Ice the cake the day before and keep cool. Serves 10-15. Hands on time 1 hour. Oven time: 55-65 min, plus cooling and setting. Serves 20-25. Hands on time 1 hour 30 min. Oven time approx 1 hour 15-25 min. Serves 35-45. Hands-on time 2 hours, oven time 2 hours 24 min to 3 hours, plus cooling and setting. 15cm x 7.5cm loose-bottomed cake tin with bases and sides greased & lined with a double thickness of non-stick baking paper, then tied with a double thickness of brown parcel paper round the outside with string to make a high collar; long-bladed palette knife; serving plate or cake board. 23cm x 9cm deep loose-bottomed cake tin with bases and sides greased & lined with a double thickness of non-stick baking paper, then tied with a double thickness of brown parcel paper round the outside with string to make a high collar; long-bladed palette knife; serving plate or cake board. Heat the oven to 170C/150C fan/gas 3. Put a shallow ovenproof dish on the bottom shelf of the oven and fill with near-boiling water. Position the shelf for baking the cake about a third up from the bottom of the oven, just above the water. Melt the chocolate in a large heatproof bowl set over a medium pan of barely simmering water for 15-20 minutes, making sure the bowl doesn’t touch the water. Be careful not to overheat the chocolate or it will turn grainy. For 15cm and 23cm: Using an electric mixer, whisk the egg whites, until stiff but not dry. Using a large metal spoon, fold 2 heaped tablespoons of the egg whites into the chocolate mixture to loosen it. Quickly and lightly fold in the rest, using a figure-of-eight motion, until just combined. For 30cm: Using a stand mixer, whisk a third of the egg whites until stiff but not dry. Using a large metal spoon, fold a large spoonful of the egg whites into the chocolate mixture to loosen it. Quickly and lightly fold in the rest, using a figure-of-eight motion until just combined. Whisk the rest of the egg whites in 2 batches and fold in each batch straight after whisking. Carefully pour the mixture into the cake tin and lightly smooth the surface. Cover the top of the paper collar with a double thickness of extra-wide foil and make a hole in the centre the size of a 50p piece. Bake for required time (this will depend on the cake size – timings specified above). The cake is ready when well risen with a nicely set crust, and when a fine metal skewer pushed into the middle comes out clean. Remove from the oven, discard the foil and brown paper, cover the cake with a clean damp tea towel and leave to cool in the tin for 1 hour. Turn it out on to a wire rack to cool completely and remove the baking paper. For the icing, put the chocolate in a large heatproof bowl set over a medium pan of hot water over a low heat for 10-15 minutes until melted, making sure the bowl doesn’t touch the water. Add the butter, bit by bit, stirring gently with a heatproof plastic spatula until melted. Remove from the heat and set aside to cool until it has started to set to the consistency of thick double cream. Meanwhile, if the top of the cake is uneven, trim with a long-bladed knife, then upturn on to a wire rack to give a flat surface for icing. Brush away any loose crumbs and place a tray underneath to catch any icing drips. Melt the apricot jam in a small pan over a low heat for 3-4 minutes, then use a pastry brush to brush it over the top and sides of the cake to prevent any loose crumbs from spoiling the icing. Pour over a thin layer of icing and then, using a long-bladed palette knife, quickly and evenly smooth it over the top and sides and set the cake aside in a cool place (or fridge if you have room) for the icing to set. When the icing has set, use a small sharp knife dipped in very hot water to carefully cut the edge of the cake base away from the wire rack. Using a cake lifter or a palette knife and sturdy fish slice (and an extra pair of hands), transfer the cake to a serving plate or cake board. Decorate the cake however you wish. Use unsprayed rose petals brushed in egg white, then covered in caster sugar and left to dry, or edible gold leaf (from the baking aisle of larger supermarkets). Fresh flowers would look beautiful too. To serve, cut the cake into long slices, then cut each slice into portions. Once the icing has started to set to the consistency of thick double cream, starting with the largest cake, pour over a thin layer of icing and then, using a long-bladed palette knife, quickly and evenly smooth it over the top and sides. Repeat with the remaining cakes and chill until set – about 30 minutes. If your fridge is not big enough, you will need to set them aside in a cool place instead and allow longer for the icing to set. Put the remaining icing back over the pan of barely simmering water to melt again, then remove and allow to thicken (as before) and give the cakes a second coat. Chill until the icing has set, then repeat the process for a third and final time and chill for about 1 hour. Any spare icing on the trays can be saved and used at the last minute to disguise any marks – just melt it, then pass it through a sieve into a small lidded container to remove any crumbs and refrigerate. The cakes are firm enough to be stacked. Decorate as you wish, but please check that all flowers are edible or use sugar paste flowers.